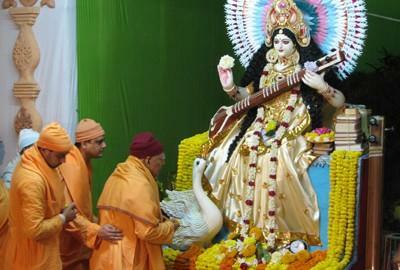 Kolkata, Feb 10: Saraswati Puja was celebrated in West Bengal on Sunday with traditional fervour. Saraswati, the Hindu goddess of music, culture and learning, was worshipped across the state and people were seen carrying clay idols of the deity with a crescent moon on the brow, riding a swan or seated on a lotus. Tiny tots and children decked up in traditional bright-yellow attires signifying 'Basant Panchami' -- heralding the arrival of spring. Women dressed pretty in saris and boys in kurtas and performing the; Anjali' (offering of flowers with prayers). This time the rituals started on Saturday as per the almanack. But the main pomp and celebration were stored for Sunday morning which continued till midday in schools, colleges, community clubs and households, with priests chanting mantras and devotees placing seasonal Palash flowers at the deity's feet to the ringing sounds of cymbals and conch shells.